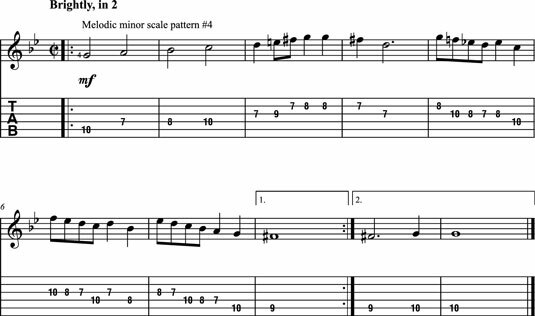 If you know how to play your melodic minor scales, you won’t have any problem learning to play Handel’s “Allegro” on guitar. The opening statement in this piece is just an ascending scale, although it is disguised with different rhythms. The faster notes in bars 5 through 7 are all just descending scale segments, but do note how beautiful they sound. Handel’s “Allegro” uses melodic minor scale pattern #4 in 7th position, starting with the 4th finger. It’s in the key of G minor and written in cut time (sometimes referred to as 2/2), which is indicated with a C and a vertical line “cutting” it in half. This symbol tells you to count the half note, not the quarter note (as you’re used to doing with songs in 4/4 and 3/4), as one beat. Because you count the half note as the beat, the measure is felt in 2 (with two beats to the bar). In bar 3 of this piece, you see two accidentals in the music: an E natural and an F sharp. These accidentals indicate that those notes have been raised as the melodic minor commands. In bar 5, the melody descends, so the melodic minor scale again requires that the E and F — raised on the way up — be in their natural state, as F and Eb, which agrees with the key signature. Notice the natural and flat signs in bar 5 just as a gentle reminder not to play the wrong notes. The melody has a nice way of building here, using slow notes in the beginning and working up to the eighth-note passages in bars 5 through 7.